Microsoft is now rolling out a new Windows 10 preview build 17083 for PC to the insiders in the Fast ring and for those who opted in to Skip Ahead. The new build focuses on new features, various improvements and bug fixes. Read the post to know more about the new features and improvements part of this new insiders preview build. Don't forget to check the Known Issues before downloading. With this new build, Microsoft introduced a new experience for managing your fonts in Settings app. You can now acquire additional fonts from the Microsoft Store itself. The initial page for Fonts settings provides a short preview of each font family. The previews use a variety of interesting strings that are selected to match the primary languages that each font family is designed for together with your own language settings. Microsoft uses Windows diagnostic data to focus building a robust and valuable platform. Based on the values, they improve the overall product experience and quality. With this build, Microsoft has added two new features for Windows Insiders which can be found under Settings | Privacy | Diagnostics & feedback. The Diagnostic Data Viewer is a Windows app that lets you review the diagnostic data your device is sending to Microsoft, grouping the info into simple categories based on how it's used by Microsoft. To get started, navigate to Settings | Privacy | Diagnostics & feedback. Enable the Diagnostic Data Viewer Toggle and then click the button below to launch the application. You can then view your diagnostics event, search through the records, filter the event categories. From this page, you can also provide diagnostic event feedback to Microsoft. 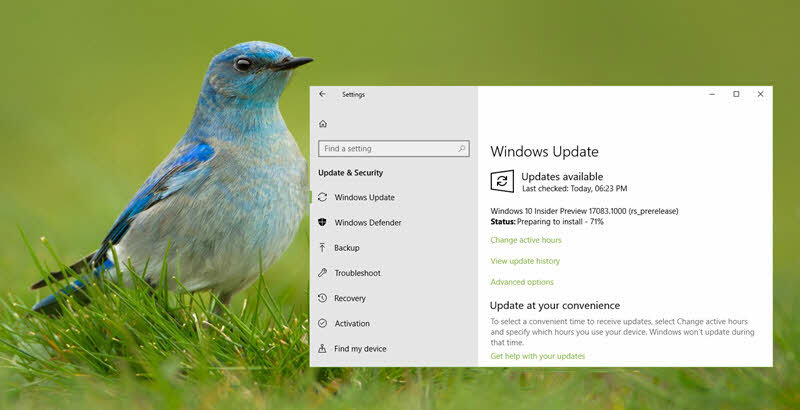 Windows 10 build 17083 contains some improvements to its Timeline feature. Based on the insiders feedback, Microsoft has added the option to delete everything from a given hour or day from the context menu. If you clicked see all to see activities for just one day, this option changes to allow you to clear all from hour instead. Because this option can clear a lot of activities at once, it will ask you to confirm this choice before deleting the activities. The second change gives you more granular control of the privacy of your activities. A new setting allows you to sync your activities to the cloud for a seamless cross-device experience. You can enable Let Windows sync my activities from this PC to the cloud in the settings app, or you can enable it via an option provided at the bottom of Timeline. Quiet Hours gets a new name! It will now be called as Focus Assist. From the Action Center, you will now be able to switch between three Focus Assist modes: Set focus assist to priority only, Set focus assist to alarms only, Set focus assist to off. Microsoft now made it easier for Microsoft account users to set up Windows Hello on their devices for faster and more secure sign-in. Previously, you had to navigate deep into Settings to find Windows Hello. Now, you can set up Windows Hello Face, Fingerprint or PIN straight from your lock screen by clicking the Windows Hello tile under Sign-in options. You can now see your UWP app version numbers within the app settings page. If you have Windows 10 build 17083 or higher, the easiest way to get to the app settings page for a particular UWP app is to right-click the app in Start and select More | App settings. Based on the insiders feedback, Microsoft has now added a dropdown to the Settings | Apps | Startup settings page so you can choose to sort the apps listed by name, state, or startup impact. Apart from all these, Microsoft also updated the Hyper-V/WSL (Hypervisor Platform API) to add support of extended user-mode API for third-party virtualization stacks and applications to create and manage partitions at the hypervisor level, configure memory mappings for the partition, and create and control execution of virtual processors. They have also added a new setting for those who would prefer their scrollbars stay always visible. It's available under Settings | Ease of Access | Display. Turning this setting off will result in the scroll bars in UWP (XAML) apps persisting as scrollbars in their full expanded size, even when not interacting with them. Apart from these, there are many other general changes, improvements and fixes in this build. To know more about those, check the original Release Notes published by Microsoft. Make sure to read the Known Issues, as this build is from the current development branch. If you have come this far, it means that you liked what you are reading (Windows 10 preview build 17083 released to Windows Insiders with many new improvements).